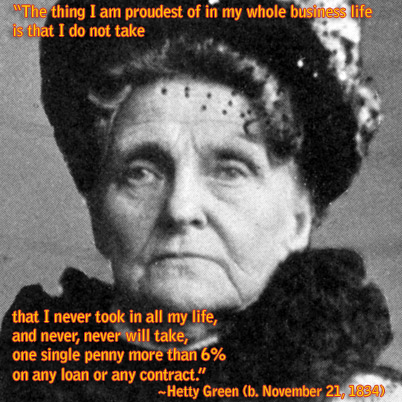 Today, November 21 is the birthday of Hetty Green, the first woman to make a fortune on Wall Street. She was born in 1834 in Bedford Massachusetts to a family of Quakers who owned a large whaling fleet and also profited from the China trade. Popularly known as the “Witch of Wall Street,” due to her penny-pinching ways, people rumored that she only owned one dress. It’s also rumored that she ate mostly pies that cost fifteen cents. One tale claims that she spent half a night searching her carriage for a lost stamp worth two cents. Another asserts that she instructed her laundress to wash only the dirtiest parts of her dresses (the hems) to save money on soap. She was well versed in finance from the age of 6, reading the financial pages to her. When she was 13, Hetty became the family bookkeeper. She was apparently pretty ruthless. When hearing of her Aunt Sylvia’s will contributing 2 million dollars to charity, Hetty challenged and even forged an earlier will to keep the money in the family and in her pocket. She was a successful businesswoman who dealt mainly in real estate, invested in railroads, and lent money. The City of New York came to Hetty in need of loans to keep the city afloat on several occasions, most particularly during the Panic of 1907; she wrote a check for $1.1 million and took her payment in short-term revenue bonds. Keenly detail-oriented, she would travel thousands of miles – alone, in an era when few women would dare travel unescorted – to collect a debt of a few hundred dollars. Frugal to the bone it seems she never sought more than she needed and still became the richest woman on Wall Street. If only her teachings had stuck. If only a few other millionaires would act with even a modicum of Hetty’s frugality. Happy Birthday Hetty. You witch. 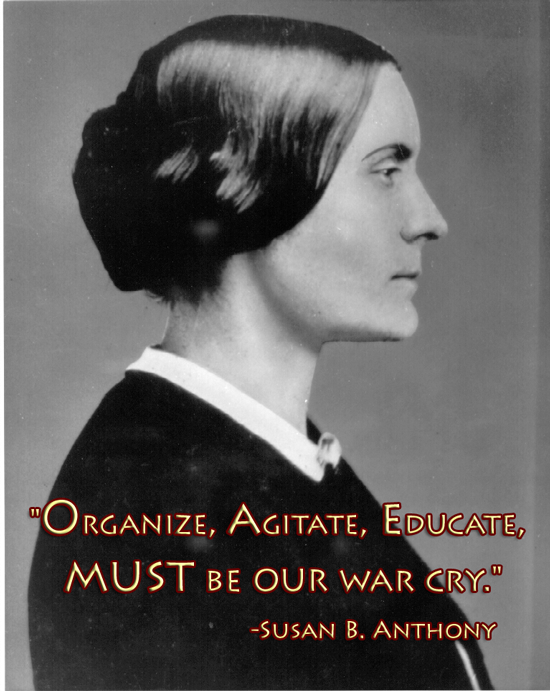 On this day, November 5, in 1872, Susan B. Anthony left her home in New York to cast a ballot for President Grant in the presidential elections, in full defiance of the unwritten law forbidding women to vote. Two weeks later, as expected, Anthony was taken from her home and arrested for voting without a right. The $100 fine she was ordered to pay was never collected, and women all over the country were energized by Anthony’s brave act. On election day in 1872, after casting her ballots, Susan B. Anthony wrote this letter to her good friend and collaborator, Elizabeth Cady Stanton, describing the day’s events. As Anthony explains, the urge to vote affected many more women in Rochester than the fourteen voters in the Eighth Ward. Officials in other wards made different decisions: some refused to register the women, some registered them but then refused to accept their ballots. At this point, Anthony had no hint that she would be arrested for her actions. Indeed, her mind was busy imagining ways that the women who failed to vote could use the courts to sue for their rights, as women in Washington, D.C., had done in 1871 and as Virginia Minor did in St. Louis in 1872. She voted Republican. Ah, how times have changed! I am positive that she never would have dreamed that the GOP would become the woman demeaning party that it is today. It is your right to vote. It is your voice. Use it. Do not be refused. Do not give up. Do not accept any stinky new voter ID laws. If you are a citizen and you are in line to vote, you have that opportunity. Stay in line! Dear Mrs Stanton Well I have been & gone & done it!! Comments Off on Do You Dare Vote?